In the words of J�rgen Klopp there is an expectation on Liverpool to make the next step this season. The first one was thoroughly convincing. 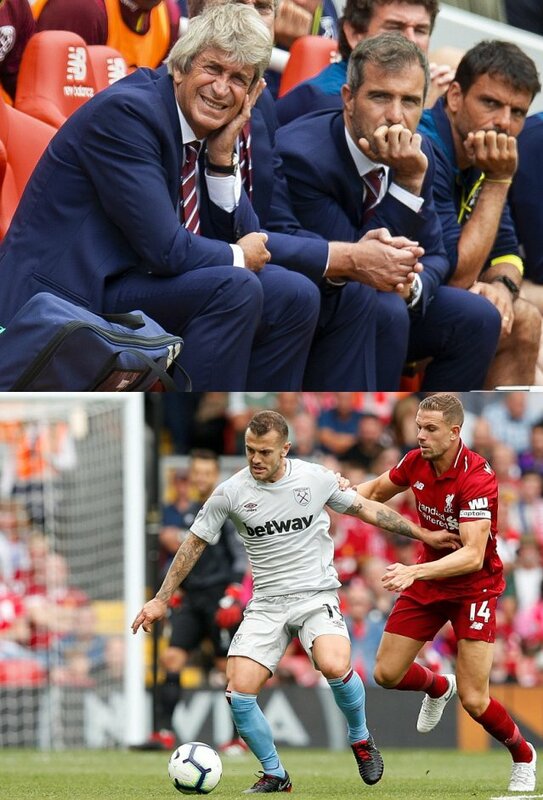 West Ham United were swatted aside as Liverpool recorded their biggest opening day win at Anfield for 86 years. With four goals on the board, and Mohamed Salah and Sadio Man� on the scoresheet, Klopp�s team slipped back into the old routine seamlessly. A reassuring sense of the familiar was provided by Salah, who opened the scoring before Man� struck twice and Daniel Sturridge registered with with his first touch after replacing the Egypt forward. Liverpool scored four or more goals 14 times last season � a record bettered only once in the club�s history in 1895-96 � and this was their biggest opening day victory on home soil since Wolves were beaten 5-1 in 1932. Liverpool ended that season in 14th place. It does not rate as the boldest prediction to state that will not be the case this time. Liverpool fielded two new additions in the impressive Naby Ke�ta and the underemployed Alisson and continued where they left off by dominating and demoralising their opponents. West Ham, with five of their summer signings in the starting XI, looked sharp and threatening only in flashes. They spent most of the contest pinned on the edge of their penalty area and relying on a well-drilled offside trap to frustrate Salah and company. It succeeded early on but never looked likely to succeed completely. The breach was inevitable as the identity of the man who launched Liverpool�s season. If there is a pressure on Salah to reproduce the phenomenal form that yielded 44 goals for Liverpool last term then he appears extremely comfortable with it. The forward oozed confidence throughout pre-season and needed 19 minutes to reopen his Premier League account. A tap-in from two yards was the end-product of a fine team goal with Liverpool working the ball out of defence and Ke�ta driving through midfield before releasing Andy Robertson on the left of the area. The full-back delivered his low cross to perfection and there was Salah at the back post to convert. Lukasz Fabianski saved well when Trent Alexander-Arnold curled a free-kick towards his top corner. Georginio Wijnaldum prodded wide after Ke�ta had weaved his way through several challenges in the area. The West Ham keeper also produced a point-blank save to deny Salah after another excellent Liverpool move around the box when Roberto Firmino escaped to the byeline. The visitors had opportunities to lift the siege but Marko Arnautovic dragged two decent openings wide. His first came from a long ball played over Joe Gomez by Angelo Ogbonna, and a deflection off the Liverpool defender brought a corner that Fabi�n Balbuena headed straight at Alisson. His second stemmed from the referee Anthony Taylor, who inadvertently blocked Wijnaldum�s attempted pass and was spared further embarrassment by the striker�s wayward finish. Rare opportunities that West Ham could ill-afford to squander. Liverpool scored a second in first- half injury time when the visiting defence switched off. Robertson was again instrumental, the left-back floating a delivery to the back post after Salah�s attempt was blocked, and James Milner reacted quicker than any opponent to ghost in and pull the ball back from the by-line. Man� was one of three Liverpool players left unmarked behind the West Ham defence and he diverted the ball into an empty net. Michail Antonio hooked an awkward volley over Alisson�s crossbar moments after the restart but Pellegrini�s attempts to turn the tide by introducing Robert Snodgrass for Declan Rice, then Javier Hern�ndez and Andriy Yarmolenko, were to no avail. Liverpool continued to pour forward and, though a third goal was a fair reflection of the game, Man� was offside when he extended the advantage. The Senegal international�s second of the afternoon owed much to the ingenuity of Roberton Firmino, who cut across the West Ham defence before flicking a delightful pass to the unmarked striker. From an offside position Man� spun and fired low beyond Fabianski. It encapsulated West Ham�s visit that their appeals for a reprieve went unanswered. There was still time for Sturridge to convert Milner�s corner at the back post with his first touch of the game. Klopp roared with laughter at the substitute�s instant impact. It was the perfect start all-round.